The last two weeks we’ve talked about fear and the mantra “If I Can’t, I Must!”. I wanted to wrap up with a couple more tips on really understanding the power of this practice. It all comes down to this. You’ve got the power! You have the power to get exactly what you want in life, whether it be the perfect job, a healthy, loving relationship or a house on the French Riviera. We talked about setting intentions, focusing and then releasing attachment to how, but there is one last added component. Your Why? Why do I want the job? Why do I want the house? What is my purpose for being here? If you don’t have a big enough why, then nothing else will matter. You have to know WHY you want what you want. German philosopher Frederick Nietzsche once said, ‘He who has a why can endure any how.’ Knowing your why is crucial in figuring out how to achieve the goals that excite you and create your dream life. Indeed, only when you know your ‘why’ will you find the courage to take the risks needed to stay motivated. So what if you know your why, you’ve set your intention, let it go to the Universe and gone about your day, only to find yourself in a freeze frame of fear? You get the call from your dream job that you have an interview, and suddenly all your self-doubt bubbles up and a laundry list of obstacles parade through your mind. It could be learned helplessness. We’ve learned that we are helpless through filters and outside influences. We may have been told to shut up, sit down, be quiet and be nice. Don’t take risks. Play it safe. As our dreams begin to manifest, we may find ourselves in old habits of “I can’t”, “I’m not good enough”. But the beauty is that we can unlearn these behaviors. How? By releasing or discharging. If a bird hits a window, it gets stunned. It may lay there frozen for a minute, but then they flail about, shaking their wings. They discharge, shake it off and go on. They don’t stop flying. We can do the same thing. 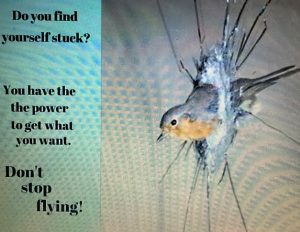 When you find yourself stuck, shake it off, voice yourself by shouting your why. Sing, dance, something that breaks the pattern of freezing. Secondly, you have the power to choose in EVERY moment how you feel. Power = the ability to choose. If something is keeping you from feeling good feelings and you have a day where you are feeling unsure, think back to a time where you did feel secure, powerful, happy. Access those feelings now. The choice is only one thought away. Nobody and no situation can take that away from you unless you let them. It’s worth it to me. I choose to have what I want. I’m going do it again. Whatever it takes to break free. That is the power. To be able to create what we want one powerful thought at a time!